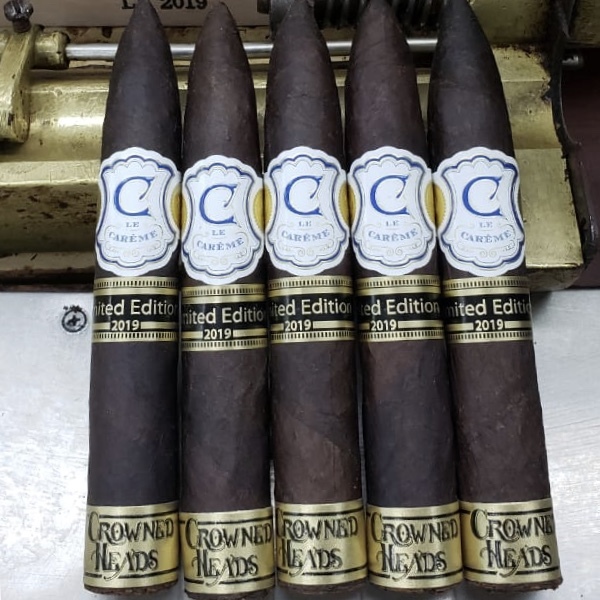 Crowned Heads Le Carême Belicosos Finos, a limited edition size of the Le Carême line that was introduced in 2018 is returning once again. Today the company announced plans for another run now dubbed the Le Carême Belicosos Finos Limited Edition 2019. The Le Carême Belicosos Finos Limited Edition 2018 landed on the 2018 Cigar of the Year Countdown on Cigar Coop, coming in at #18. Le Carême is produced out of Ernesto Perez-Carrillo Jr‘s Tabacalera La Alianza factory. The blend features a Connecticut Broadleaf wrapper, an Ecuadorian Sumatra wrapper and all Nicaraguan fillers. Both Connecticut Broadleaf and Ecuadorian Sumatra are tobaccos Perez-Carrillo has become known for using. While Le Carême is an all box-pressed line, the Belicosos Finos LE2019 is a 5 1/2 x 52 rounded figurado, the same as the LE2018. Production will be limited to 2,500 12-count boxes with a total production of 30,000 cigars. Pricing is set for $10.00 per cigar or $120.00 per box. Le Carême pays homage to French Cuisine and gets its name from the 19th-century French Chef, Marie-Antoine Carême. The inspiration to go in that direction occurred when Perez-Carrillo Jr. remarked that the blend reminded him of a chocolate soufflé.